Every 30th May, Biafrans all over the world remember their heroes and heroines who died during the Civil War and those whom the Nigerian Murderous military brutally killed and still killing till date. It is very important that we remember our dead ones who gave their lives that we might live. And every 30th of May, we honour them by observing that day with prayer and supplication unto God on their behalf. In the past, we usually observe 30th May, Biafra heroes and heroines day in an open field where all Biafrans gather to pray and pay homage to their dead ones but because the Nigerian murderous Military, Police, Navy etc go there to kill our people in their thousands whenever this historic event is going on. 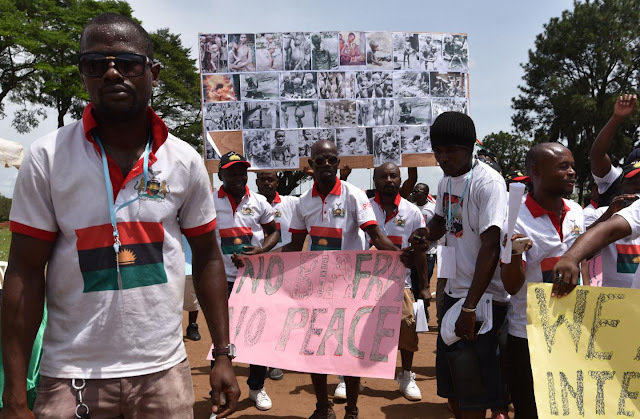 As a result of such ugly act by the Nigerian security agencies, IPOB has made it mandatory now that every 30th May, Biafrans especially those in Nigeria should observe the event by sitting at home. They believed that by adopting this method, Biafrans will not be seen outside to be killed or taken away by the murderous Nigerian Military, Police, Navy etc, except they could be callous enough to go from house to house to kill them and take them away. Therefore, I urge all our people both at home and in diaspora to join hands together to ensure that this year's 30th of May is observed in a dynamic way. Tell all your people, your loved ones and your friends who love freedom that 30th of May IPOB 'Sit at Home' is here again and must be observed by all. It will be disrespectful if we fail to remember our heroes and heroines who fought gallantly to make sure that we come out from slavery from the evil country called Nigeria, therefore, we must always remember them. Still on that day, we shall also remember our people the Nigerian Army killed during a rally in Port Harcourt in celebration of Donald Trump's Presidential victory on the day of his inauguration as the 45th President of America. On that day also, we shall remember our people the same Nigerian Army killed at our Leader's house during their meaningless 'Operation Python Dance'. Thank God for our leader Mazi Nnamdi KANU who summoned courage to adopt this 'Sit at Home' order for us if not, the death rate would have continued to increase every 30th of May. In view of this coming and important event of IPOB, I appeal to our people who are in charge of all the Markets, Schools, Parks, Shopping Malls, Offices, Churches, etc to ensure that those places are totally shut down on the 30th of May, 2018. This is very important. And also all our people who have private establishments where people are working should kindly sacrifice that day by declaring it a holiday for their workers to enable them participate in this important Memorial Day. Shut down all your Shops, Schools, Offices, Markets and all business places that day. it is not optional, neither is it negotiable, but it is a MUST that we all should remember and honour them that day.